On today’s show Neil interviews James Smith. As you know, the 91 Untold Change Project aims to explore how change happens across different domains – organisational, personal and social. 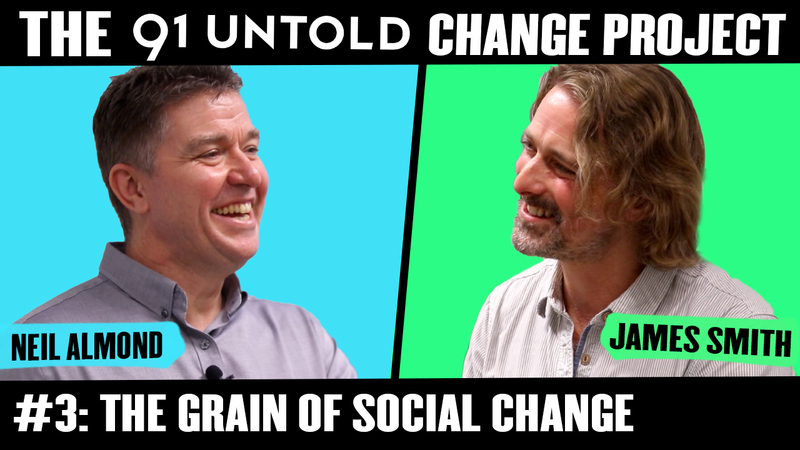 As one of the pioneers of the social enterprise movement in the UK, James has a unique insight into how effective social change can be achieved and the qualities needed by social change agents. Much of this insight was earned during James’ time as CEO of The School for Social Entrepreneurs, an organisation he founded alongside Michael Young, Lord Young of Dartington (perhaps best known for founding organisations such as Open University and the Consumers Association). Michael was arguably one of the finest social thinkers of the last century and Neil wanted to use this opportunity of talking to James to also tease out any lessons we can glean from the late master. Equally important to our project research are lessons from James’ current adventures as a social and environmental leadership consultant. Neil’s friendship with James goes back to 1999, when he was a student at the school setting up Kikass. Neil later became a visiting tutor for the SSE and an action learning set facilitator. James is a social and environmental leadership consultant focusing on learning, strategy and innovation. He was one of the pioneers of the social entrepreneurship movement in the UK, co-founding two of its key institutions, the School for Social Entrepreneurs (SSE) and Unltd: the Foundation for Social Entrepreneurs. To find out more about what we do and how it can help you or your business, just pick up the phone or drop us an email.